I've had my Yamaha Vino for about 6 months and ride it almost exclusively. I hardly know how to drive my car anymore... I find myself dodging around potholes and manholes and such in my Subaru! I have to catch myself! I love the way this scooter rides; low, comfortable, and balanced. Compared to my partner's Zuma scooter, it is easier to ride since the weight is closer to the ground. The previous owner rebuilt and replaced some of the plastic body, had some engine work done at a cheap shop, which meant that my partner had to replace or tighten about half of the bolts in the engine and body. But, it ran smooth off the bat, and with very little maintenance has continued. It has about 6k miles and has a long life ahead of it. It was a great value and perfect for my local, urban lifestyle. The parts are relatively affordable and easy to find locally. It would be nice if it were faster. It tops at about 40 going down a steep hill, and going up steep hills, it's gone down to 15mph. My average ride to the market is about 25-30. That's okay since most of my riding is local, but I'd like to be able to ride on more major roads. The battery isn't standard. It is more expensive and requires a different, more expensive charger than my spouse's Yamaha Zuma. I would like to be able to give my kid a ride once in a while, but this is a bike built for one. (Maybe that's a good thing!) It does carry about $80 worth of groceries under the seat and in my milk crate. Overall, I love this scooter. Wouldn't trade the body style for a faster scooter. 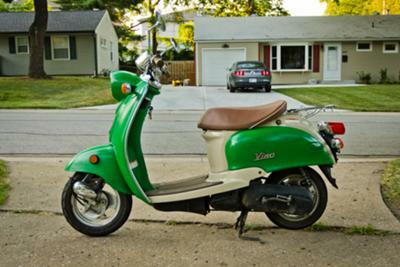 I would recommend a Yamaha Vino scooter to any first time buyer, young rider, anyone who rides locally and loves the classic "Vespa" look.